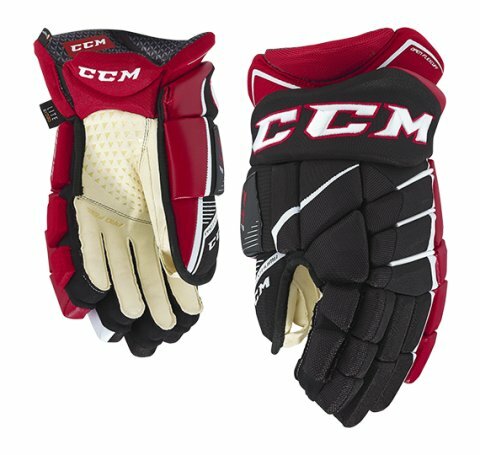 The CCM Jetspeed glove offers a new and improved design with a tapered fit. D3O® Smart Material and Zotefoam® provide a superior level of protection. The Flexthumb and Open Flexcuff deliver an excellent fit to help increase maneuverability and feel, while the Polygiene treated liner with PU cushion foam and Pro feel clarino palm makes the glove exceptionally comfortable. Construction: PRO Selected Polyester and Synthetic Leather combined with lightweight and protective foam. Lightweight pro level protection and very durable. Fingers/Backhand: PRO level D3O® + ZOTEFOAM® and PE inserts package. Extreme lightweight construction with PRO level protection. Thumb: PRO Flexthumb. Increased mobility for a better grip. Palm: PRO FEEL Clarino base palm with extra layer of embossed reinforcement. 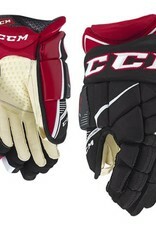 Soft feel for ultimate stickhandling experience. Cuff: Anatomical OPEN FLEXCUFF. Enhanced freedom of movement, flexibility and protection.